Well, here it is. 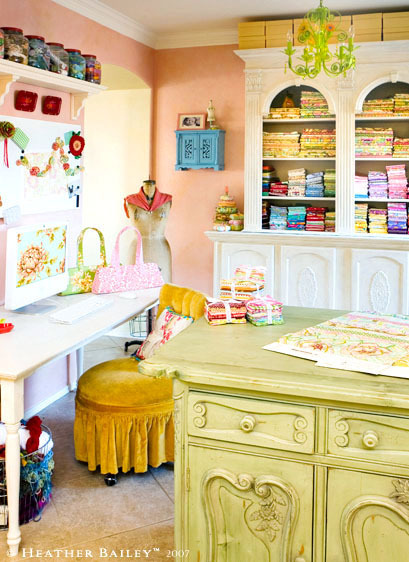 This is where I spend my days, The Sugar Shop. I picked up the bookshelf at a local antique store for $150. It was poorly white-washed, with gobs of butter-yellow paint slathered on the details. Isaac re-finished it for me and built the base for it to rest on. Yep, that's right. He built that footed, four-door cabinet-base up there. It now has a gently-distressed cream finish -- far better. I store my art supplies, sewing notions and wool felt in there. The yellow boxes above hold less-frequently-used items, like velcro and grommets, linoleum blocks for stamp- carving, elastic and cording. In fact, I have Isaac to thank for most of the other furniture as well. He not only built the cabinet, but the computer table, sewing tabletop and shelves as well. 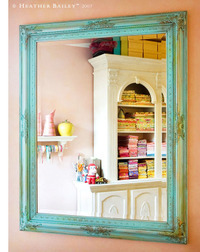 And, of course, there's the green chandelier and the turquoise mirror you know all about. 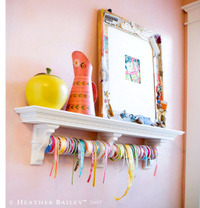 The pink walls are subtley mottled with bit of cream and a splash of funky metallic gold here and there. The large frame resting on the ribbon shelf is decorated with Isaac's grandmother's old sewing notions, and it's covered -- a fun piece to study. A row of red-lidded jars above the computer table houses most of my ribbons. And my buttons and whatnots are tucked away in the happy green drawers on my sewing table. The tall green work-island has a ton of storage, with cabinets and drawers on each side. I brought this piece home last summer as a solution to The Shuffle Kerfuffle. I store my sketchbooks and rulers in one drawer and keep the other drawers sacred for quick clean-ups. (Translation: they're messy-full of random un-finished projects.) 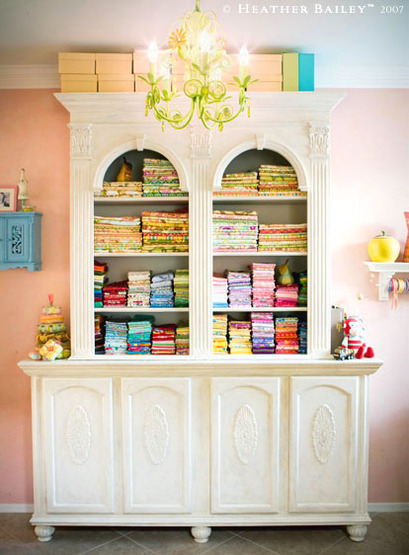 These cabinets contain art papers, zippers, vintage linens, interfacings, unfinished quilt-tops and stationery. Toss a few of my favorite things into the room, and I'm right at home: pink floral pitcher, tacky 70s apple tin, vintage red floral trays, crocheted monkey, ornate cookie tins, photos of my babies. Are you playing I Spy yet? Let's see, what else: pink toy sewing machine, antique wooden spools, gold velvet chair and a tissue-paper corsage from my son. My studio.